Rubber and plastic missiles have been used extensively by both British and Israeli authorities in riot control. They are intended to incapacitate by inflicting painful and superficial injuries without killing or serious injury. They are supposed to be fired at ranges no less than 30 to 70 meters, depending on the missile, with fire directed at the lower extremities. Figure 10.20 12-gauge flechette round. Rubber and plastic bullets used by the Israelis are smaller and faster but have considerably less kinetic energy. Four types of rubber bullets have or are being used.22 Two are spherical in configuration and measure 1.8 cm in diameter; two cylindrical, measuring 1.8 cm in diameter by 1.8 cm long. One of the spherical forms and one of the cylindrical are plain rubber. The other two are steel with a thick rubber shell. The pure rubber bullets weigh 8.3 g with a muzzle velocity of 75-100 m/s and kinetic energy of 23.3 to 41.5 J. The rubber coated steel bullets weigh 15.4 g with a muzzle velocity of 100 m/s and kinetic energy of 77 J. Rubber bullets are fired from a metallic canister that is mounted on the muzzle of either an M-16 or Galeil rifle. The cannister can hold up to 15 rubber bullets. The Israeli plastic bullet is a 0.85 g, caliber 5.56-mm, bullet-shaped missile that is loaded in a 5.56 x 45 cartridge. 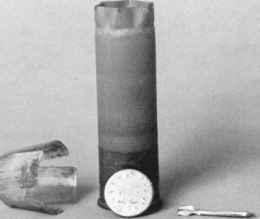 The bullet is composed of polyvinyl chloride and metallic fragments. Muzzle velocity is 1250 m/s; muzzle kinetic energy 663.7 J.
Hiss et al. reported 17 deaths from Israeli rubber and plastic bullets.22 Ten died from rubber bullets; seven from plastic bullets. In nine of the ten cases involving rubber bullets, the rubber coating was separate from the steel core. Six of the cases involved penetrating wounds of the head; one of the thoracic wall. In three instances, there was no penetration of the body but there was brain injury (two cases) or spinal cord injury (one case). The entrance wounds were described as "lacerations of varying size and shape." They ranged in size from 0.5 x 0.4 to 7.6 x 4.2 cm. In the seven cases involving plastic bullets, three penetrated the head and four the trunk. 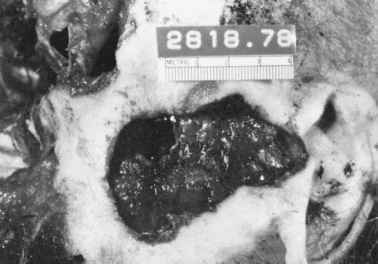 The entrance wounds resembled conventional small caliber bullet wounds with abrasion rings.